Want it Tuesday, July 9? Building on a critical overview of current social movement theory, this book presents a structural model for analyzing social movements in advanced capitalism. This model provides a historically specific analysis that locates movements in global, national, regional, and local structures. The heart of the book draws on diverse theoretical traditions within sociology to specify the structural constraints and opportunities that comprise the environment in which movements mobilize and contest for power. These theoretical traditions include world system theory; critical theory; theories of class, race, and gender; and theories of everyday life. Movement dynamics are explored in terms of their dialectical relationship with these multiple levels of structure. The book also addresses the false dichotomies between political and cultural dimensions of social activism, and restores a critical, normative dimension to the analysis of social movements. Buechler makes a unique argument about the need to reorient social movement theory toward the structural, macrolevel contexts in which movements arise. Clearly presented, this thoughtful introduction links the theoretical traditions that make up the core of the discipline to the subfield of social movements. It is an excellent supplementary text for advanced undergraduate or graduate courses in sociology as well as for courses in such related disciplines as collective action and political protest. 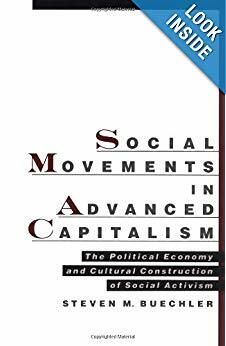 Social Movements in Advanced Capitalism contains a detailed, critical overview of the collective behavior and social movement theories that have taken place over the past fifty years. Steven M. Buechler is at Mankato State University.